Call & Response is an annual exhibition of collaborations between writers and visual artists, in which ones calls and one responds. The result is a dynamic set of paired works of words and artistic media that resonate and speak to contemporary issues. The theme for the twelfth annual Call & Response is Borders. What are borders? How do we define them and how do they define us? A river, a mountain range, a line scrawled on a map, the skin enveloping the body, the boundary between one mind and another. Borders are the edges that separate us, but they are also the lines, categories, and groups that define us. Emotional, physical, and metaphorical borders have been drawn around people, around land, and around ideas in the name of protection, defense, inclusion, and exclusion. The participating artists and writers are asked to consider and examine the borders that interest them — their intersections and parallels . 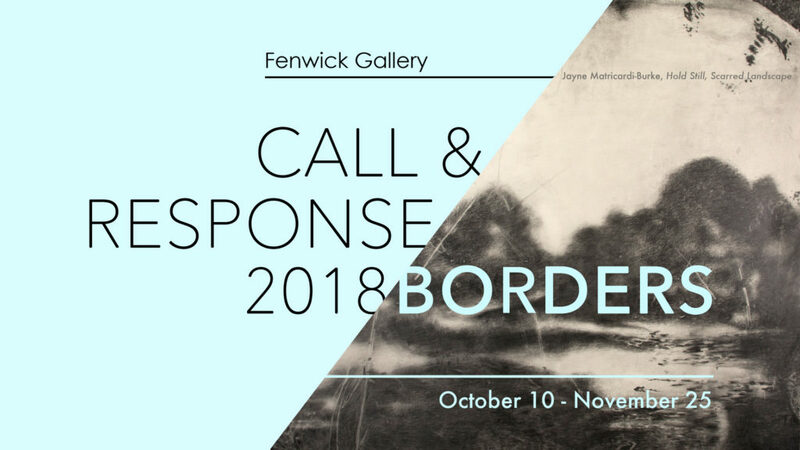 Call & Response: Borders will be on display from Wednesday, October 10 – Sunday, November 25, 2018 in Fenwick Gallery. An opening reception and panel discussion with the artists is scheduled for Wednesday, October 10 at 1:30pm, during the Fall for the Book Festival on Mason’s Fairfax campus. Call & Response is a collaboration between the Mason School of Art, the English Department’s MFA program in Creative Writing, and the University Libraries, and is presented in conjunction with the Fall for the Book festival. The Rappahannock Parking Deck is closest to Fenwick Library and offers visitor parking.